The results of the BlindFaith project are published at the 15th International Conference on Computers Helping People with Special Needs – ICCHP´16. The ICCHP is a mayor, international recognized venue for research in the domain of people with special needs. The conference took place from July, 13 to 15, in Linz, Austria. The paper “Insights Into Internet Privacy For Visually Impaired And Blind People” by Georg Regal, Elke Mattheiss, Marc Busch and Manfred Tscheligi was presented in the Special Thematic Session on Accessibility of Web and Graphics. Details can be found in the conference program. The complete proceedings can be downloaded from the ICCHP´16 website. To promote the results of the BlindFaith project, we presented the information material at a “smartphone meeting” in March organized by the Hilfsgemeinschaft. We explained the topic internet privacy to visually imapired participants and discussed possibilities to protect ones privacy. In summer we conducted two workshops with ten visually impaired and blind internet users to create a first draft of an interaction design for a browser-based privacy-enhancing tool, which allows blocking trackers. The created interaction designs (in the form of as HTML prototypes) will be evaluated with ten user tests and compared to the existing tool Ghostery. Based on the evaluation results, we will revise the interaction-concepts and derive general design guidelines. We created an online survey, to gather feedback about the comprehensibility of the information material compiled in BlindFaith regarding “accessible internet privacy”. The survey takes about 20 minutes and all participants completing it until November 13 have the chance to win a 20 Euro Amazon voucher. Thank you very much in advance for your help! The feedback will be used to improve the information material and adjust it to the needs of visually impaired and blind internet users. Since 2006 the A-TAG, hosted by “Verein Accessible Media”, is the meeting point for topics regarding internet-accessibility in Austria. At A-TAG 2015 BlindFaith will be presented to the interested audience. 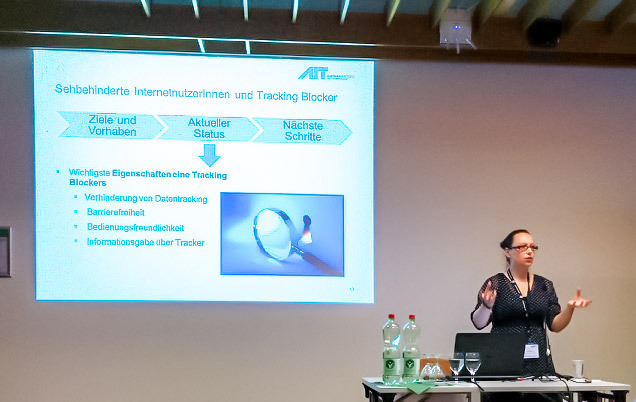 We will present the insights gathered in the requirements analysis, the developed design guidelines, and the interaction and feedback design for the accessible tracking blocker. Information regarding the program can be found here: http://atag.accessiblemedia.at/#nav-speakers (in German). There is an article about BlindFaith in “The 2015 Book” of AIT Austrian Institute of Technology. On July 7, BlindFaith was presented by Elke Mattheiss to an interested audience at the am IKT-Forum. Today we will present the project BlindFaith at the IKT-Forum in Linz and discuss the project with a broad audience from research, development, theory and practise. We hope to get in touch with interesting people and find synergies between BlindFaith and other projects. Control of blocked trackers: users should be able to decide, if a tracker is blocked or not, because some services are used although privacy concerns exist. Personalization of warnings and information: e.g. acoustic warnings are important for blind users but considered as annoying by some visually impaired users. Acoustic warnings are important for blind users: like the pattern used by the JAWS screen reader a short, concise tune shall be played, which informs the users that trackers are found or respectively blocked. Visual feedback is important for visually impaired: visual feedback should not be to intrusive and sufficient contrast is an important factor. Participants explicitly mentioned that feedback should be provided on multiple channels. Warnings should be used sparingly but additional information can be accessed easily: the user’s workflow should not be interrupted too often by warnings. But if further information is wanted, additional information should be provided by a keyboard shortcut. To gather the requirements of blind and visually impaired users for an accessible tracking blocker, two workshops, an expert review and interviews were conducted. Furthermore blind and visually impaired users used a tracking blocker and provided us with feedback. The workshops have shown that privacy concerns and protection of internet privacy are an important topic for visually impaired and blind users. However, the workshop participants had little to no experience with privacy protecting tools. The threat of behavioral analysis and targeting is known by the participants and considered as a threat with medium severity. Due to their visual impairment it was considered as more difficult to recognize threats on the internet. Participants stated that this results in a more careful behavior while browsing the internet. Regarding the accessible tracking blocker participants stated, that the tool must be completely accessible and easy to configure, to enable the users to decide which trackers are blocked and which are not. Observations of users trying out a tracking blocker and interviews with ten blind and visually impaired internet users were conducted. The interviews confirmed the impressions gathered during the workshops, that privacy threats are known by experienced blind and visually impaired internet users. Tracking and collection of personal data were often mentioned as threats in the interviews. Providing too much (or unwanted) information on the internet was one of the major concerns of the interviewees. When asked explicitly about collection of personal data, participants stated that they are well aware that data is collected, but no one used tools for protection. The analysis of the laddering interview shows, that accessibility is a major quality a tracking blocker should have. Values that are important are protection of personal privacy, control, equality of opportunities and self-determination. A tool for blocking data collection should consider these values.